Asia is the largest and most visited continent in the world. It means we definitely cannot miss it! We will visit region of East Asia, aka the Far East. We intend to explore Indochina too. Of course we also plan to travel to the South and the Southeast Asia and we certainly cannot forget the Middle East. Asia is going to be a big culture shock for us. There are so many religions and cultural differences that we do not know personally. We will face us a completely different experience than that in America from where we arrive here from. Our trip around the world will firstly bring us to one of the most technologically advanced countries – the island nation of Japan. A visit to such a different culture and especially to travel in Japan by local speed trains sounds really exciting! What we want to definitely see is the local traditional architecture. Even China, which we plan to visit afterwads, lags behind in this area. In China, among others, we will also focus on local cuisine which is very rich and diverse in each region. And we will enjoy delicious delicacies also in other parts of Asia, for example in the southeast. Southeast Asia is perceived by many visitors as the pearl of the continent. And it is no wonder as there are many beautiful countries that offer visitors activities in all possible ways. We also intend to target this part of Asia and one of the first destinations we want to visit here will be Vietnam. Not only because this country offers spectacular beaches to spend the most wonderful holiday but it also pleases a hungry tummy of every traveler by its fantastic cuisine. Vietnamese cuisine is truly one of the best. Thailand is another country we plan to visit. Likewise it offers many nice experiences. Thai monuments and natural parks are among the most visited throughout Southeast Asia. Topping the most popular of the sites could well be Angkor Wat in Cambodia. However this will not be the only place in this kingdom we want to visit. Our trip around the world will also take us to Malaysia. It was recommended to us by our friends. The local life along the coast is worth experiencing and it is said that a visit to the capital city leaves you literally captivated. And those are moments we simply cannot miss. As well as a visit to our friends in the city-state of Singapore that we have met thanks to CouchSurfing. This kind of invitation should not be rejected. But after such a lot of traveling we will become very tired. Therefore we will need to enjoy a moments of rest. One of the most well known islands in Indonesia – Bali will give us this. On Bali we would like to spend around 3 months and experience the life of the local communities and explore the neighboring islands. A holiday in Asia will not come to an end with our stay on Bali. But before we continue our journey through Asia, we will fly to visit the antipodes in Australia and Oceania. Once we are back from the continent of endemism our travel plan will take us to the island of Sri Lanka. Sri Lanka is primarily known for its production of tea, but it also offers more interesting attractions than just tea plantations. The biggest surprise for us will be India. Staying in India is a big attraction for us and preparation for it will be quite challenging. We plan to spend at least 2 months here and travel only by train. And after a holiday in one of the most populous countries in the world it will surely come quite handy to spend a few days trekking in the Himalayas. The most ideal destination for Himalayan nature appeared to us to be Nepal. Maybe we will see, at least from distance, the world’s highest mountain, Mount Everest. 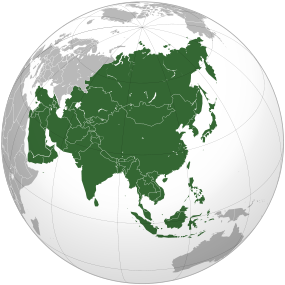 Middle and Near East are the regions which are not too often associated with Asia, even though they geographically belong there. These places attract us again because of their differences, which offers an entire continent. In the first place we will go to the Middle East where we will visit the United Arab Emirates. We want to see the contrast of modern cities full of luxury and wealth, which is mixed with slums where the local ordinary citizens live, and that all is surrounded by inhospitable desert. We will stay in the desert, but move to the Middle East where we will explore Jordan. And in this country, our trip to Asia finally ends as we will move to our final continent, Africa.